Ermm ... for the sake of all our sanity, I'll keep the explanation of "why" short. Phonetically, [r] and [d] are quite similar to each other - both are articulated at the same place using the tip of your tongue. Really, the only articulation difference is the length of time that the tongue is in contact with the palate. Actually, just taking a quick trip round the world, languages often change [d] into [r], and vice versa. In American English for example the -tt- between vowels has become much like [r] in words like matted, butter, and so on. So it's quite common for funny stuff to happen between or around r and d sounds. Let's just leave it at that. So Gaelic introduces a [d] sound in sr clusters, but doesn't replace the r. It's the northern dialects that do this, as you can see on the map. So what's the problem? Twofold, really. 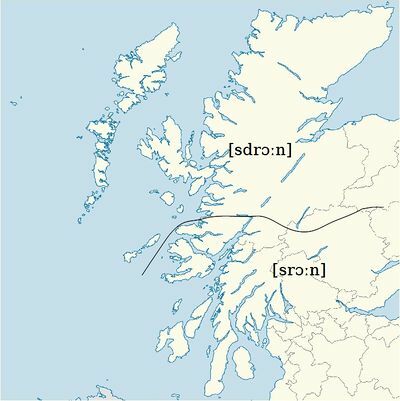 The [sdr] pronunciation has been dominant for so long that it's started to creep into the spelling, bit by bit. And with overall literacy rates in Gaelic dropping and dropping over the centuries, people have followed the conventions less and their ears more. Similar to the slochd/sloc problem. So, the neat solution is, if you can't lenite it, spell it str. And if you can lenite it, spell it sr. You'll end up mostly with loanwords on the str side and mostly with native Gaelic words on the sr side. So, as a rule of thumb, if it looks a bit like an English word, it probably has unlenitable [sdr] and should be spelled str. Air a tharraing à "http://akerbeltz.org/index.php?title=Intrusive_T_or_Why_we%27re_writing_sròn_not_*stròn&oldid=1898"
Chaidh an duilleag seo a dheasachadh 5 dhen Lùnastal 2013 aig 02:09 turas mu dheireadh.